How healthcare revealed the sickness of our political system. 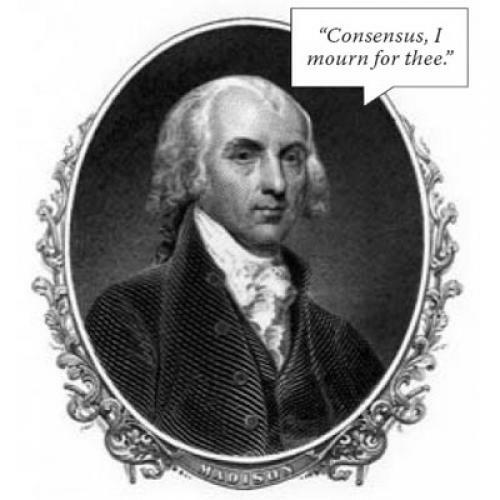 "Among the numerous advantages promised by a well-constructed union, none deserves to be more accurately developed than its tendency to break and control the violence of faction," James Madison wrote in Federalist Number 10. "The friend of popular governments never finds himself so much alarmed for their character and fate as when he contemplates their propensity to this dangerous vice." Consider us alarmed. Our sense of alarm has been growing for some time. From the moment Barack Obama entered the White House, the Republican Party has cast itself as the Party of No. Whether it was the stimulus bill--which garnered not a single Republican vote in the House--or the nomination of Sonia Sotomayor to the Supreme Court--which only nine of 40 Senate Republicans supported--the GOP has defined itself in its opposition to Obama. But our alarm has been tempered by the knowledge that, in a way, this is as it should be: In our form of government, the minority party should be the opposition party; and, while the Obama administration did make overtures to the GOP on the stimulus and its selection of Sotomayor, those overtures were largely symbolic. The factionalism, while regrettable, was understandable. But, this week, as the health care reform battle reached a crucial juncture, the violence of faction has become gratuitous. We refer, of course, to Max Baucus's long-awaited health care reform bill--and the resounding thud with which it landed on Capitol Hill. There are many flaws in Baucus's bill, but there is one thing that can be said for it: It represents as sincere an attempt in recent memory to achieve consensus. For the last three months, Baucus, as chairman of the Senate Finance Committee, worked with five other committee members--two Democrats and three Republicans--to draft legislation that could garner bipartisan support. As the leader of the so-called "Gang of Six," Baucus was the target of frequent criticism from fellow Democrats, who complained that he was taking too long in drafting his legislation or that he was being too solicitous of Republicans. And, while these criticisms had merit, Baucus labored to come up with a bill that represented at least a rough compromise. In almost Solomonic fashion, Baucus crafted a bill that gives something to--and takes something away from--each faction. Virtually every industry group--from hospitals to drugmakers to device manufacturers to insurers--that faces new fees or budget cuts in the Baucus bill is rewarded with additional revenue from the legislation. And, when it came to winning over Republicans, Baucus went more than halfway: eliminating the public option, strengthening protections against federal funding of abortions, and lowering the legislation's price tag. And what did all of Baucus's efforts get him? Well, from most key interest groups, outright support or, at the very least, not much indication of outright opposition. But, from one of the two major political parties that, theoretically at least, is supposed to represent many of those interest groups? Absolutely no Republican support--not even from the three GOP members of the Gang of Six, two of whom (Mike Enzi and Chuck Grassley) voiced their outright opposition and one (Olympia Snowe) who remains on the fence. To be sure, Baucus's bill failed to elicit much in the way of Democratic support, either. Jay Rockefeller, who sits on the Senate Finance Committee, announced that he would vote against Baucus's bill as drafted. But it's not hard to imagine Democratic critics ultimately supporting the bill—especially if, as appears likely, changes are made and Obama encourages them to do so. Alas, there appears little chance that any Republicans will be similarly moved. Already, Orrin Hatch, the number two Republican on the Senate Finance Committee, is demanding that Democrats "take a deep breath and start over on a truly bipartisan bill"--as if Baucus's legislation was something else entirely. And there is no Republican figure who appears capable of rallying the GOP to the side of health reform. The Republican reception of Baucus's bill doesn't so much represent a crisis for health care reform as it does a crisis for our system. The GOP is no longer representing interest groups; rather, it has become an interest group itself--and an implacable one. So that a compromise piece of legislation that achieves a rough consensus among the various factions in the debate fails to get even one vote from one of the two major parties. Where to go from here? Having failed to win over Republicans, Baucus should now labor to win over Democrats. If that means having Massachusetts appoint an interim replacement for Ted Kennedy's seat--or even passing some of the reform through reconciliation--then so be it. If Max Baucus's months of work achieved nothing else, he has unmasked the true nature of the contemporary GOP and, in the process, revealed just how broken our political system has become.